Who hasn't dreamed of leaving it all behind, of quitting the city and hopping a train to the glorious green of the countryside? 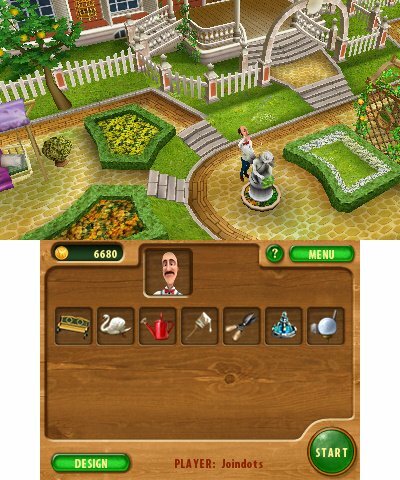 Gardenscapes plays off of this desire, casting you as the young inheritor of your grandfather's country home and garden, now both sadly in disrepair. Restoring the once-beautiful garden will require some serious funds, and your new butler Austin helpfully suggests that you use the massive piles of stuff littered around the house to finance the operation by holding jumble sales. The game that follows is a dependably decent hidden object search that will gratify fans of the genre, but doesn't do much to innovate or capitalize on its theme. 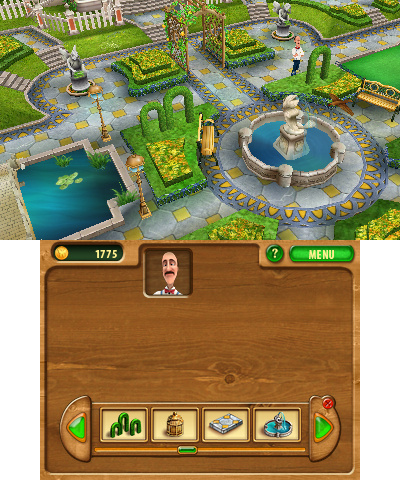 For all its narrative focus on the garden, Gardenscapes is an item-finding game at heart. Working your way through a predetermined set of rooms in your new house, you'll use the touch screen to search for hidden objects, listed on the top screen, which your customers are looking to purchase. The controls are very simple and work well, and southpaws are happily catered for with the face buttons panning the scenes just as well as the Circle Pad. Part of the challenge comes from the fact that you happen to attract incredibly impatient customers, who are willing to pay less and less for your priceless light bulbs and baseball hats the longer you take to find them. Normally, each stage comes with a five minute time limit in which to find the 20 objects you're looking for, but there's also a "Relaxed Game" option, available at any time, that gets rid of the time restriction. Customers will still pay less as time goes on, and you'll miss out on the helpful cash from time bonuses in this mode, but it's a nice option for players looking for stress-free spotting. Even with the time limit, it's never too hard to find what you're looking for, as there are three different kinds of hints to help you locate particularly stubborn objects. Finding a thermometer will tell you whether you're "hot" or "cold" to each item, uncovering a camera will flash the screen so that only relevant objects appear for a moment, and using one of your five question marks will show you exactly what something in your "to find" list looks like. Apart from the odd Objet D'art, most of the items you're searching for are quite quotidian. With relatively little variety, they start to repeat fairly often; you'll uncover many a teacup and perhaps a telling number of wine bottles in your grandfather's house. The same goes for the rooms you're rooting around in; there are 15, and you'll have to revisit each of them at least a few times each to get your garden looking its best. From time to time you'll receive bonus missions, such as finding 20 books in a room to sell to the local library, and these are generally pretty fun and break up the main gameplay nicely. The garden itself is initially underwhelming, as per the game's premise, but does start to come into its own as you populate it with flowers, benches, topiaries, ponds, and fountains. Restoring the garden to its former glory is satisfying and should be more engrossing than it is, but it's held back by a number of limitations. First off, there's only one way to view the blossoming results of your industry: by panning around a slightly tilted, zoomed-out bird's-eye-view. 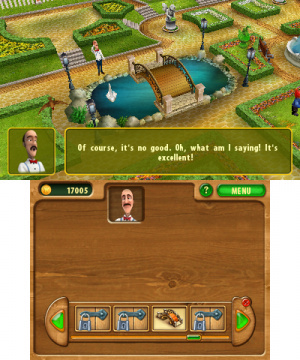 Customization is similarly restricted; there's the option to "design" each of the 20 objects you can add to your garden, but this only lets you pick one of three pre-set choices. 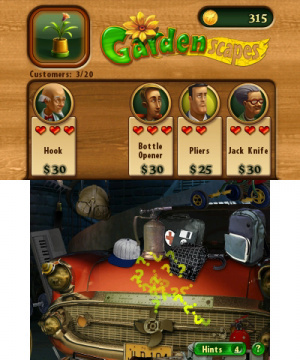 Your only other interaction with the garden is tapping on different actions for Austin to perform - water the flowers, throw food at the swan - so that the "garden" portion of Gardenscapes smacks of missed potential. Wouldn't it be nice to stroll through the garden you've invested so much in? Or view it from another angle? Or - and this really doesn't seem too much to ask - zoom in? Even if its garden setting is underused in the gameplay, Gardenscapes does nail its atmosphere. The art style is quaint and fits the country manor theme well, and apart from an incongruously funky victory jingle, the background melodies are nice and relaxing, and the sound effects fittingly bucolic. From a technical standpoint, however, Gardenscapes does just enough to get by, with nothing to suggest the game couldn't have been done just as well as a DS title. 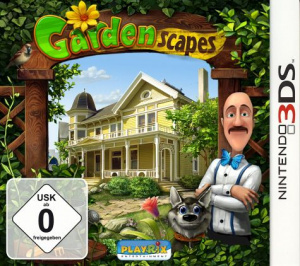 There's also no use of the 3D effect apart from the garden and the title screen, which is disappointing. It's good, but it could've been much better had they done more with the garden part of the game. Hmm...this looks interesting still; do you think there'd be a chance for DLC to add to the garden part? To be honest, I highly doubt they'll add anything to this game in the future. Well that saved me a purchase or at least delayed one. I might pick this one up later after a have bought a few other games that are higher on my want list. @Tasuki Yeah, that's my thought on this. Nothing interests me about this. Move on. Great review. I might get this for my mom since she loves hidden object games (and she racks up 1-hour demos on the computer, so now she can actually go through it entirely). I already live in the countryside, so this game isn't for me.. I'm still interested in this, just because it's a decent sounding hidden objects game and I don't have a portable one yet. Price seems a bit high, unfortunately. Too bad about the wasted potential but overall this seems to have come out better than most in the genre that are available on DSi/3DS. Though I'd love to hear any other suggestions before I buy. *Goes and play Viva Pinata instead. This is retail in Europe, FYI. £10 on Amazon. This was a good hidden object game, for the Dsi, highly addictive, but I imagine with the 3d it's better. This game is actually pretty good. The Hidden Object parts are very well done and it's just very relaxing to play. Much, much better than the horrible 3DS incarnations of Mystery Case Files.